Buying vintage toys on eBay can be a great way to build your toy collection. I've picked up specimens that I wanted to add to my toy collection and found pieces to replace broken or missing parts for vehicles, playsets, and action figures. However, buying online can have it's drawbacks. The online auction site, eBay, has helped me restore countless toys and always with pleasant experiences. 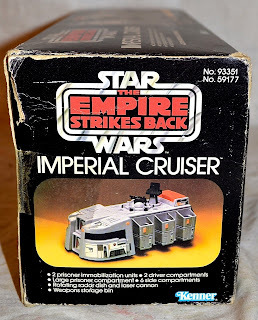 However, while working on my Kenner Imperial Cruiser toy restoration project I had won a bid for an original box for this Sears Christmas exclusive that was not quite what I had hoped for. Here's look at the pics that were posted for the sale. Now, not a perfect box by any means, but I did feel the seller did cover all sides of the box and I was happy with what I was expecting to get. I always ask question when buying collectibles, especially boxes, but this time I didn't. Always, always, ask questions. 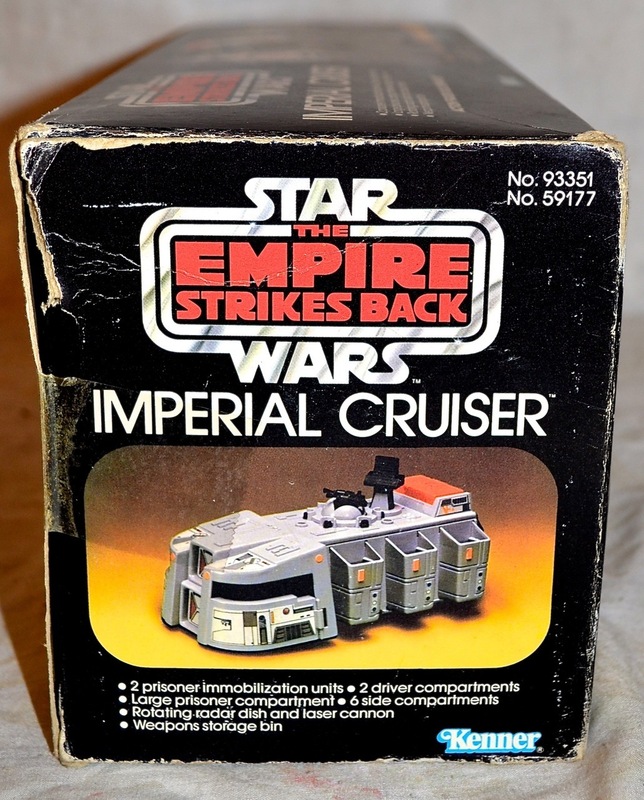 When buying boxes such as these, I will ask the seller if the flaps on both sides are intact as well as, if there any tears from when the toy was opened, in most cases where the box was taped shut. In this case, I didn't ask any questions. Just bid to my hearts content. Big mistake because here's the one side of the box the seller didn't take a picture of. Watch for sellers who say they are not collectors and they don't know if the toy works. Most likely the toy doesn't work. For the other side of the coin, when selling toys put some batteries in the toy and see if it works. If not, let your buyers know. Watch for sellers who tell you to be sure and look at the pictures. It is warning that the pictures aren't worth a thousand words. Beware of sellers that stress that you asks questions. It is common courtesy to open the door to your potential buyers, but stressing the point to ask questions is saying, "Well, you didn't ask." This in turn is another red flag that means I am not telling you any flaws upfront in hopes that you don't ask. Since I've never had this happen before the dilemma I have now is, what kind of kind of feedback should I leave for the seller? Positive, neutral, negative? After all, I didn't ask questions. Let me hear what you think. I would honestly leave negitive feedback as I feel the seller purposely didn't take a picture of that side of the box. I'm sure he didn't want to distract potiental buyers away from it, so I bet he didn't show that side on purpose. I would email the seller and let him know you were unhappy with the purchase and see what he intends on doing to make it right. I'm sure he would want to make sure his customer is happy incase something else comes along later that you might want to buy from them. That's pretty much what I've been thinking. Thanks Mike for sharing your ideas. If you are just buying the box then you need to see the whole box. I can forgive the box a bit more if the figure is complete inside it. I would leave a negative feedback but like you, I generally have good experiences. I just hate the poachers who steal good bids from me at the last minute. Those are becoming rarer and rarer these days. Thanks Cal. I get frustrated with that as well. I find myself having to way over bid sometimes to insure I win if I really want the item. I agree with the others above. There is no way that he just accidentally didn't take a picture of the mangled side of the box. Definitely make sure to leave negative feedback on a dishonest seller. Who knows who else he has affected that didn't leave negative feedback. What do you think of the new format Doc? That's cool you were able to snaze him up a bit. I should be able to clean the box up and nurse it into shape. It looks good on the shelf anyway. Thanks JBoy. I will most likely be changing it up again soon. Thanks for your advice and thoughts on the new blog design Colin. I have a love hate relationship with the new design. Not 100% what I wanted. I am getting a lot of compliments on it though and some folks have some difficulties with it. Time will tell if it sticks.